I regularly shoot with a “Big Game Rifle” club which has some fabulously fun shooting events such as the “Harley’s Hop” as shot by the Zimbabwe Professional Hunter’s and Guides Association, and the Howdah Pistol event which requires a “Howdah pistol of a minimum caliber of .375″ that may be single or double barrel, firing a minimum bullet weight of 300grains and producing a minimum muzzle energy of 1000ft/lb”. By now some of you reading this will be asking “But what is a Howdah pistol“? Gentlemen in India ready to embark on a tiger hunt. 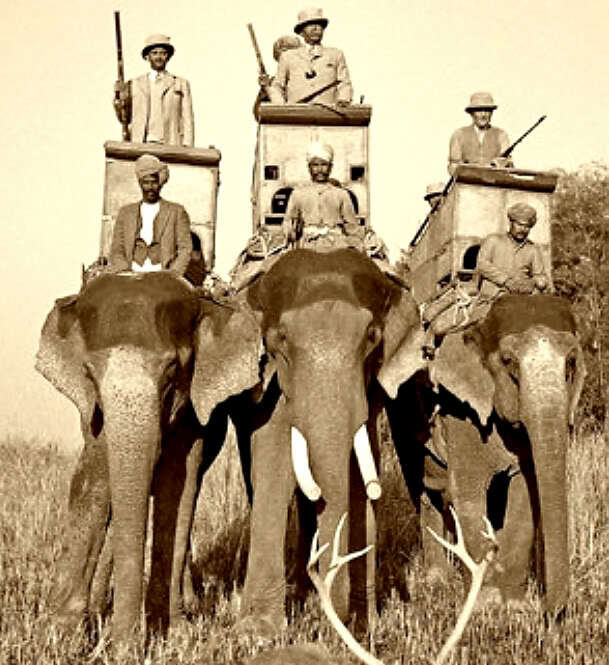 The box like saddle on the elephants is called a Howdah. In typical British Colonial style you will note that jacket and tie are required for the gentlemen and double rifles are “de rigeur”. (Picture courtesy forums.nitroexpress.com). A howdah is the carriage carried on the back of an elephant that people ride in. The name comes from Arabic هودج (hawdaj) which literally translates as “Bed carried on the back of a camel”, except in India the carriage was carried on the back of an elephant. Often elephants with a howdah were used for hunting especially when out on shikar hunting for tiger. On a howdah, whether it was being used for hunting or not it was quite normal to have at least one or two howdah pistols located at the corners where they were easily accessible in case an aggressive tiger decided to jump into the howdah and invite itself to dinner. In colonial times tigers in India had a well earned reputation for dining on human beings. 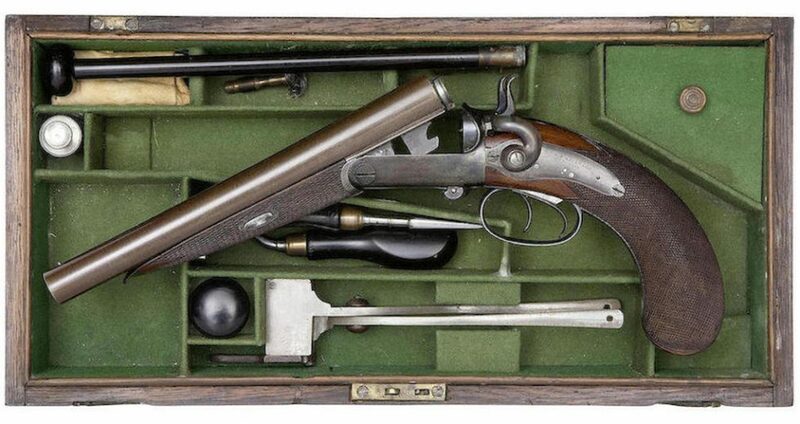 .577 breech loading double barrel, side lever howdah pistol by W. & J. Kavanagh, Dublin, Circa 1870. Note the extensive checkering on the pistol grip and fore-end; this is a handgun that will need a firm slip free grip to reliably deal with an overly friendly big striped cat. (Picture courtesy Bonhams). The howdah pistols were carried as defensive weapons whether out hunting or not and their primary use was against tigers or other big cats. These pistols can be single, double or quadruple barrel and in large calibers such as .577, .50, or 20 gauge for a smoothbore. Most were black powder arms. If a tiger decided to attack they would often go for the mahout, the person riding just behind the elephant’s head who controls the elephant. 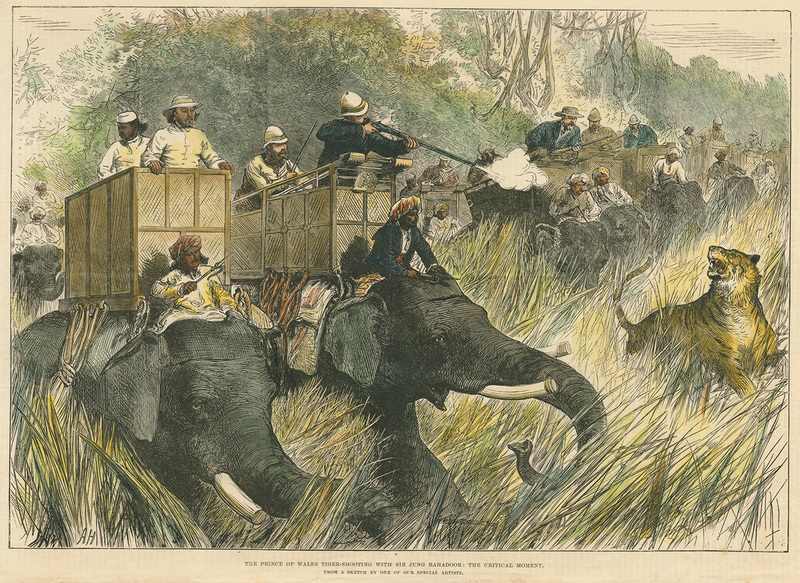 One hunter said of the use of the howdah pistol “to be effective, the muzzle must be placed close to the tiger’s head, and care must be taken not to kill the mahout.” The howdah pistol was the weapon of last resort used in close encounters of the tiger kind at muzzle to muzzle point blank range. The antique howdah pistol in our picture above is a genuine 1870 vintage breech loading side lever made by W. & J. Kavanagh, of Dublin, Ireland. It is coming up for auction by Bonhams at their Antique Arms & Armour sale to be held on 17th May 2017. You will find the sale page for this historic piece if you click here. And for those who’d like to read a bit more about adventures involving a howdah pistol and a tiger you might like Larry Blunk’s post called “The Howdah Pistol – Built for the Final Charge.” on The Explora.com which you’ll find if you click here.